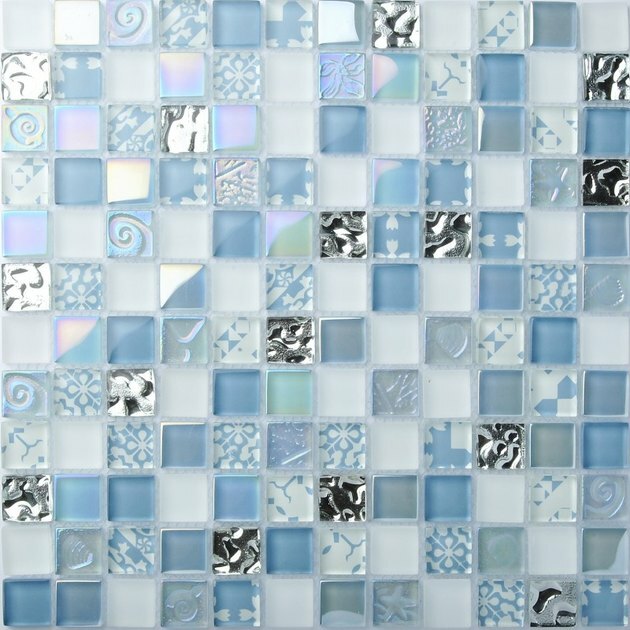 Today's mosaic tile comes in sheets of small individual tiles adhered to a flexible mesh backing. The sheets typically measure about 12 inches square, and the mesh can be cut easily with a utility knife. If the layout is such that the individual small tiles need to be cut, you can use any of the standard methods you would use with individual tiles of the same material. For all types of tile, the best tool is a wet saw with a diamond blade. 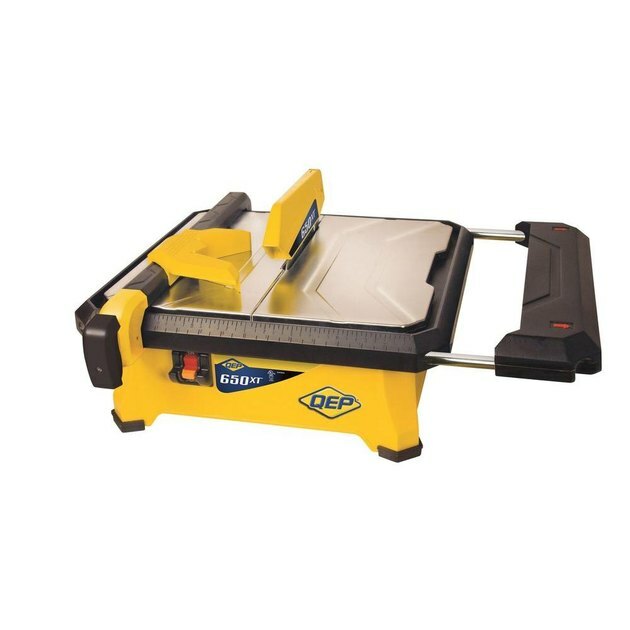 With ceramic, porcelain or stone tile, you can also make cuts with a manual tile snap cutter or tile nippers, but a saw is easier to use and makes cleaner cuts. Trimming glass tile that's too small for the wet saw can be done with wheeled glass nippers. Mosaic tiles are attached to mesh backing. There's nothing special about measuring and marking mosaic tile, as opposed to standard tile, but with mosaics, you can mark the mesh backing or the top face of the tile. Just keep in mind that if you have to cut the tile itself, you must cut it with the tile facing up and the backing facing down. In this case, you can transfer marks from the backside to the front side, or simply mark the front side from the start. If you're cutting only the backing, you can mark the mesh only and cut on the backside of the sheet. When measuring for cutouts, such as electrical boxes, you usually have to measure over from the last full sheet of installed tiles. 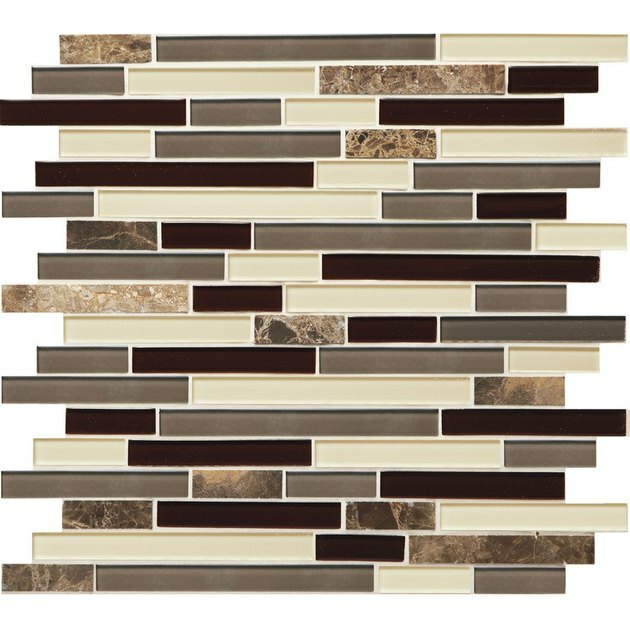 One thing to watch out for here is with tile sheets that have interlocking edges, such as the popular subway-style glass mosaics. Because the tile joints are staggered, or alternating, the edges of the sheets are not straight. When measuring for cuts, make sure that the tiles you measure from are the ones that will meet when the cut sheet is installed. In other words, if you measure from an indented space on the edge of the installed tile sheet, measure from a projecting tile on the sheet you will cut. Alternatively, if there's no adhesive yet on the wall, you can simply lay the sheet to be marked on the wall or floor, fitting it into place, then mark the cutout on the tile faces. The spaces between tiles usually make it possible to see through the sheet well enough to make your marks outlining the cutout. You can mark the mesh backing of mosaic sheets with a fine felt-tip marker. To mark the faces of tiles, use a carpenter's pencil or a china marker (also called a grease pencil or a glass marking pencil; sold at home centers and art supply stores). Standard pencil lines may wash off under a wet saw, but a china marker won't. China marker lines can be wiped off of the tile with a damp rag. For glass tile, you can also use a Sharpie or similar permanent marker on the face of the tile; just be sure to test it first to make sure it will rub off. Basic straight cuts are best made on a wet saw because the sheet can lie flat on the saw's sliding bed, and there's minimal disruption of the individual tiles. Mark the cut line on the front of the tile, using a china marker or felt-tip marker, as appropriate. Place the tile sheet face up on the saw bed, aligning the cut line with the saw blade. Make sure the nearest edge of the mosaic sheet is positioned flush up against the lip at the front of the saw bed. Turn on the saw and let it come up to full speed. Make sure the water is soaking the blade. Press down on the tile sheet with your hands on both sides of the cutting line, keeping your hands clear of the blade. Carefully slide the bed into the blade to make the cut. Move slowly and steadily, and do not force the tile into the blade; let the blade do the work. When the cut is complete, shift the tiles away from the blade and remove them from the bed. 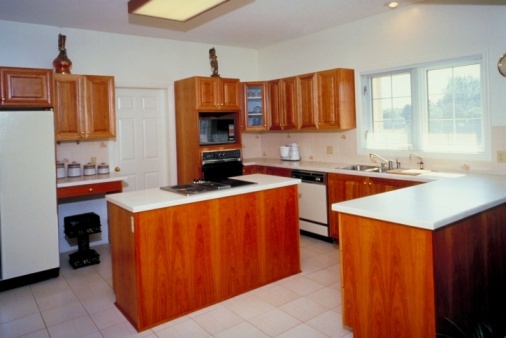 Smooth or hone the cut edges of the tiles with a rubbing stone or sanding block, if desired. Cutouts for electrical boxes and other obstructions are easiest to make if the cutout aligns with the joints between tiles, so you can simply cut through the mesh backing and remove the tiles and backing together to make the hole. If you're not so lucky, you have two options: You can cut in from the edge of the sheet if the cutout is a notch. If the cutout is an interior cut, you can peel off individual tiles from the mesh backing, make the desired hole in the backing, then trim each tile and stick it onto the wall after the rest of the sheet is installed. You can make these cuts with a wet saw or tile nippers. To cut individual titles with a wet saw, support the tile firmly with your fingers, and move the tile gently into the saw blade. Pay close attention at all times to keep your fingers out of the way. Wet saws are much easier and safer to use than table saws (their distant cousins), but they can still give you a nasty cut. If you're not comfortable making close cuts with the saw, use tile nippers instead. To cut tiles with nippers, place the tile between the nipper jaws and squeeze the nipper handles to bite through the tile. Because mosaic tiles are usually small, most cuts require just a single bite with the nippers, but if the tile is relatively large or the cut is curved, nibble away the tile in small bites until you reach the cut line. 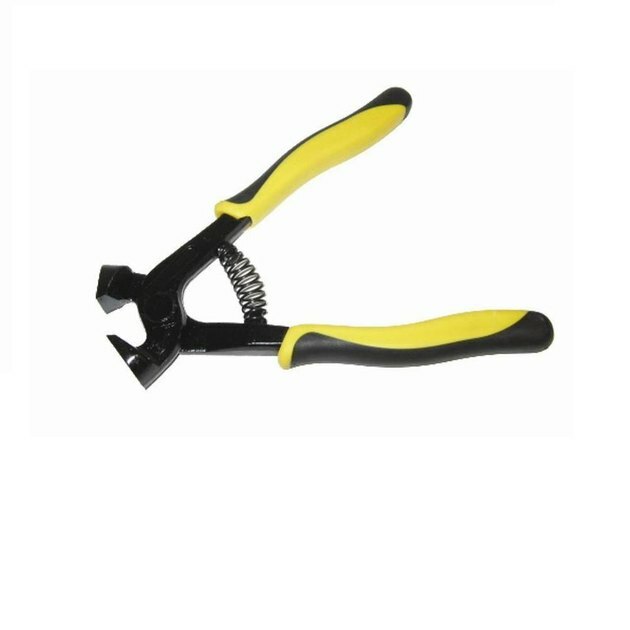 Use wheeled tile nippers on glass tile. These work just like standard nippers, but instead of flat jaws, they have two carbide cutting wheels that do the biting. They're sold through hardware stores and glass craft suppliers, and are standard tools for tile and stained glass artists and crafters. 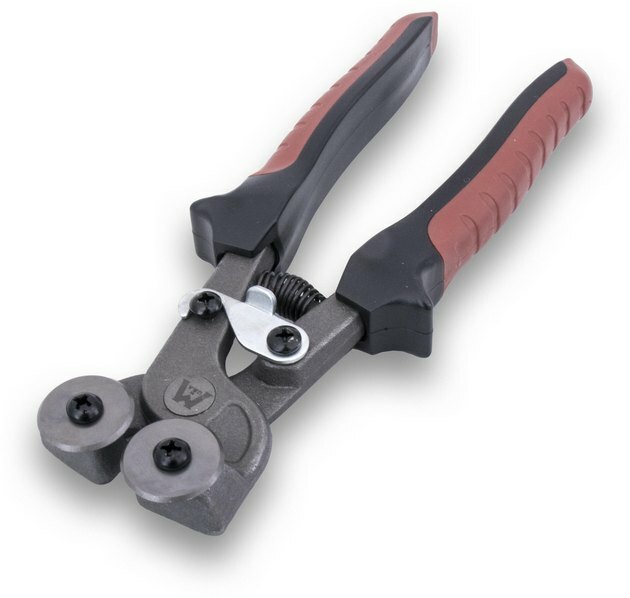 Wheeled tile nippers are the best choice for cutting glass mosaic tiles. Cut sheets of mosaic tile install just like regular full sheets, but the cut pieces can be more floppy and may take extra care to align. Place a cut sheet into the adhesive on the wall, pressing gently at first, just to keep it from sliding. Align the tiles by eye, sighting down the grout joints from two directions, and adjust the sheet's position as needed. Finally, press the sheet fully into the adhesive with a rubber grout float to make sure all the tiles are flat and properly set in the adhesive. To install individually cut tiles, "back butter" each tile by applying adhesive to the back of the tile, then set it in place, making sure it is flush with the surrounding tiles.